AEP River Operations has responded to the growing emphasis in the marketplace on ‘green issues’ and reducing the carbon footprint of cargo transportation. The company is improving the efficiency of its water vessels with new technology to reduce its environmental impact and operating costs. AEP captured the industry’s attention with the transformation of the Donna Rushing by adding/enhancing systems that have the least environmental impact of any towboat on the river. This vessel utilizes many first-in-kind technologies used in the river industry. A team effort integrated the suggestions of both AEP employees and outside agencies to achieve the final result. The boat includes many other environmentally friendly features and has influenced the choices that the company makes with all future building projects. AEP is also in the process of installing a three-stage water purification system on all of its vessels that will put an end to the need for bottled water on the boats. When installed throughout the fleet, this effort will eliminate disposal of a minimum of more than 250,000 plastic bottles per year. AEP is installing a new lube oil filtering system on its vessels that eliminates the need for literally ‘many thousands’ of paper filters and the disposal of oily waste from its boats. In keeping with its green efforts, in May of this year, AEP River Operations became a SmartWay Transport Partner. The US Environmental Protection Agency launched the SmartWay brand in 2004. The SmartWay brand identifies products and services that reduce transportation-related emissions. AEP looks forward to continuing its work towards cost-effective and environmentally efficient transportation. As of 27 June,AEP River Operations has not had an environmental spill or incident in 597 days. An achievement like this can only happen when everyone is committed to following policies and procedures. AEP River Operations is committed to its teammates and to the environment. AEP River Operations transports a range of commodities, including steel, grain and grain products, sugar, fertilizer, cement, lime, limestone, project cargo, alumina and aluminium, gypsum, coal, petcoke, ores, steel raw materials, scrap metals, sand, gravel, liquids and other bulk products. The company has 2,770 barges and more than 70 boats. It operates in a market where it has fewer than ten fully integrated competitors. In order to diversify revenue stream, the company launched the first of 20 tank barges at Jeffboat on 30 January. The new barges will all be 10,000-barrel, externally framed units designed for clean chemicals. The barges are 35 by 200 by 12.5 feet, heavily built weighing approximately 424 tonnes. The barges have three cargo tanks with a combined capacity of 11,000 barrels, five wing tanks, a rake void and a stern void. The cargo tanks have ‘six-pound tops’, and can withstand pressures of 6.4 pounds-per-square-inch before venting. AEP River Operations is a wholly-owned subsidiary of American Electric Power (AEP). AEP is one of the largest electric utilities in the United States. AEP River Operations is a fully integrated barge line delivering over 65 million tonnes of dry cargo each year. AEP’s fleet of boats (70) and barges (2,770) operate along the Gulf Coast to as far north as Minneapolis, Chicago, and Pittsburgh and to as far south and west as Brownsville and Catoosa and points in between. The company’s headquarters is in St. Louis, Missouri with regional operations in Pittsburgh, New Orleans, and Mobile. Its boat and barge operations are in Lakin,WV and Paducah, KY with Gulf operations including a full-service shipyard, barge cleaning and repair, fleeting and shifting, and midstream transfers. In June 2011, in accordance with its target of zero harm to the environment,AEP River Operations began purchasing B-5 biodiesel (5% ethanol, 95% diesel) for its fleet of towing vessels. Biodiesel provides a life-cycle emissions reduction of 78% compared to petroleum diesel. When this effort began, only two fuel vendors had B-5 available for purchase. After using B-5 fuel on some of its vessels,AEP witnessed very favourable results in way of emission reductions. Consequently, the company approached other fuel vendors to persuade them to provide B-5 at its mid-stream fuelling facilities. AEP River Operations requests that its fuel vendors provide B-5 fuel for purchase whenever feasible. workboats in the United States are from overboard accidents. Most of these occur when it is dark and unwitnessed. Two factors contributed more than any other in the successful rescue of a person who has fallen overboard; a personal flotation device and a way to be found. AEP River Operations is an industry leader when it comes to safety. Its employee injury rate is among the lowest in the inland barge and towing industry as measured by the American Waterways Operators. The addition of ORCA alarms will help it keep AEP mariners safe. AEP River Operations has been recognized as having 38 vessels which operated for two full years or more without a crew member losing a full turn at watch because of an occupational injury. The Devlin Award Certificates are awarded to all self-propelled merchant vessels that work accident-free for two or more years. The awards were presented at the Annual Ship Safety Achievement Awards Luncheon in New Orleans on 29 May. At the end of October last year, the UK’s five major Rail Freight Operating Companies and Network Rail announced the formation of The Rail Freight Alliance. The formation was endorsed by the Rail Delivery Group after a framework and set of strategy objectives were agreed by the Rail Delivery Group’s Freight Group; with a view to delivering a sustainable and flourishing rail freight sector in the UK: v delivering whole-industry cost savings, v developing ‘smarter use’ of the network, and v a sustainable charging framework for freight. Transport of bulk cargoes by river is perhaps the most serene yet relentless way humankind has so far devised to move those less-conveniently located products and ores that underpin our economies, writes Richard Knight. Where the zenith of transport is speed, by river it is accumulation. Such dichotomies are often found in river transport. In JP Knight’s long experience on the Berbice and Suriname rivers in South America, the simple act of going from A to B, from loading point to discharge point is far from a straight line. The transport route on the Berbice in Guyana has in the order of 60 bends over a distance of 125 miles, which equates to a turn every 20 minutes. with empty barges bound for the loading facility, when over the tug’s VHF came a call for urgent assistance. A mooring boat had overturned whilst attending a ship in port and the three crew were in the water. Amidst the sound of the general alarm, the tug’s fly boat was launched and Kutari’s search lights raked the river banks upstream, all the while the tug and its barges stemming the tide. In a co-ordinated search and rescue operation with the police and the port authority, two men were safely recovered, but regrettably one remained missing and was not found until the next day. Such an event remains mercifully rare, but constant drills and training have a true and indispensable value. We boast of the accumulation of tonnage, the distances travelled (2.7 million nautical miles, for example), of horse power and numbers of barges, but the truth is we should boast of our officers and crews and recognize the extraordinary professionalism that can go unseen. Picturing remote river operations can be a challenge in itself. The gifted and (as it transpired) cool-headed photographer Karel Donk, took to a helicopter to capture one of our convoys as it pushed barges loaded with bauxite through the sinuous rivers of Suriname. One of his remarkable pictures is featured here, which shows the lengths a professional will go to get ‘that’ shot: the helicopter losing lift as it settled almost on the water. A description of the shoot can be found on our blog at JP Knight’s website. What one cannot help but notice is the solemnity that Mark Twain described, perhaps even a majesty, as a convoy impudently descends the slight margin cut through the lowland rainforest. Not leaving a trace of your passing whilst amassing vast tonnages is surely the environmentally intelligent proposition? Transnet Freight Rail (TFR) is the largest operating division of Transnet Limited, a state-owned company (SOC) with the South African government as its sole shareholder. It is a world-class heavy haul freight rail company that specializes in the transportation of freight. Transnet Freight Rail has approximately 28,000 employees, who are spread throughout the country. TFR owns and maintains a network of 20,500 route kilometres (22,000 track kilometres) connected to ports and the rail networks of neighbouring countries. The company services a wide range of industries including, but not limited to; mining, coal, iron ore, manganese, steel, chrome, cement, granite manufacturing, agriculture, automotive, petroleum and chemicals. in 2012,TFR moved 201mt, surpassing the 200mt mark for the first time. TFR maintains an extensive rail network across South Africa that connects with other rail networks in the sub-Saharan region, with its rail infrastructure representing about 80% of Africa’s total. The company is proud of its reputations for technological leadership beyond Africa as well as within Africa, where it is active in some 17 countries. Mineral mining and chrome business; and 6. Steel and cement. These business units are accountable for specific customer groupings and control allocated geographical areas for operational purposes. Allocations of these areas are based on activity levels related to the customer groupings the units are accountable for. Operations are centrally controlled and the central operational structures have been re-aligned to optimize operations across the business units. against the backdrop of sound business principles, a regulatory framework and the challenges of meeting the expectations of our customers. The Transnet seven-year Market Demand Strategy (MDS), introduced by President Jacob Zuma in his State of the Nation Address on 9 February 2012 is the centrepiece of government’s growth strategy through investment in infrastructure. It is also a key component of enabling the aspirations of the New Growth Path (NGP). The MDS will catapult Transnet Freight Rail (TFR), towards becoming amongst the top five railway companies in the world by 2020. Rail volumes will increase from approximately 200mt in the 2012/2013 financial year to 350mt in 2020. By then,TFR will have increased its market share of container traffic to 92% from the current 79%. The increase will have a major impact on reducing the cost of doing business. Studies conducted by Transnet show that rail in South Africa, on average, is 75% cheaper than road transport which is rails biggest competitor. In addition, the large scale shift of rail friendly cargo off the roads and onto rail will address costs and congestion on South Africa’s roads as well as reduce carbon emissions. This strategy aims to deliver a lasting economic, social and environmental value to society. general freight 75% countrywide spend. employee reward, incentive & Gain Share programmes. processes & systems and MIS supporting business unit organization design. increased security to prevent cable theft. Since the 2012/2013 fiscal year till year to date,TFR has received a total of 153 new locomotives that are operating on the organization’s network. These locos include 105 class 43D locos, 16 Class 19E’s as well as 32 class 15E locomotives. All these locomotives have various interesting aspects like the fact that the class 43 D’s are more reliable than their predecessors and are equipped with all the latest technology. The 15 and 19 E locomotives are also more technologically advanced, with their AC/DC capabilities, their regeneration technology and ergonomics, which are a plus for the drivers. The technology embedded within these locos allows TFR to be more reliable and more efficient in the service we provide. On 22 October 2013,Transnet announced that a consortium led by Chinese manufacturer, CSR Zhuzhou Electric Locomotive (CSR), was the successful bidder for the supply of 95 electric locomotives to be used in Transnet Freight Rail’s General Freight Business. The purchase will boost operational performance, reliability and overall energy efficiency of the rail service. 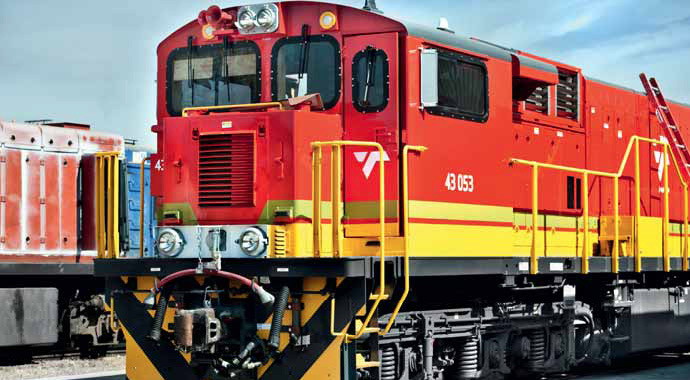 Following the conclusion of the procurement of the 95 locomotives, on 17 March 2014,Transnet announced that it had awarded a R50 billion contract for the building of 1,064 locomotives, to four global original equipment manufacturers (OEMs). The majority of these locomotives will also be used for TFR’s general freight business. This is a drive to modernize Transnet’s fleet and improve availability, reliability as well as achieve customer satisfaction. The contract was awarded to CSR Zhouzhou Electric Locomotive and Bombardier Transportation South Africa for the supply of 599 electric locomotives, while General Electric South Africa Technologies and CNR Rolling Stock South Africa (PTY) Ltd will build and supply diesel locomotives. The multi-billion-rand acquisition is the country’s single biggest infrastructure initiative by a corporate. TRANSNET FREIGHT RAIL: SUSTAINABILITY & GREEN INITIATIVES Sustainable development is increasingly playing a major role in terms of determining future strategies for business around the globe. Sustainable development is the one that considers the integration of the social, economic and environmental factors into planning, implementation, and decision-making in order to ensure that business developments fully serve the present and future generations. Transnet Freight Rail prides itself in being one of the leading role players in freight logistics transport in South Africa, and subscribes to sustainability and green economy principles. It has put in place the Sustainability Governance Structure and is entrenching sustainability principles into its daily operations. This commitment is an integral part of its corporate strategic plan. carbon management plan and reduction of carbon footprint. In pursuance of these green initiatives,Transnet will draw strength from the solid partnership it has established with government at all levels, community organizations, business partners, its customers and clients. In doing so, as it has previously surpassed expectations, it will continue to identify community needs within its areas of operations and implement sustainable poverty alleviation project. This mandate is well entrenched in Transnet’s stakeholder engagement and corporate social investment policies.